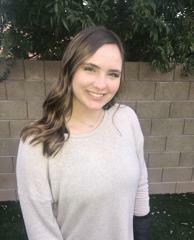 Emily Robinson was born and raised in Tucson and graduated from Cienega High School in 2018. She played volleyball at Cienega High School for four years as a right side. She also played club volleyball for Zona’s travel teams for 6 years and in that time won a National Qualifier her 16s season and a National Championship her 17s seasons. Emily is currently in her first year of college and is playing volleyball at Pima Community College. She is studying Physiology to become a surgeon. Emily began coaching with Zona during the 2016 club season.